My passion is your workout experience. Weather you just started or been working out for years doesn’t matter. I’m here to motivate you to move, to push your boundaries in your movement patterns and to get you feeling stronger and healthier. That’s my goal. I'm stronger, faster and lighter than I have been in years and Frida makes training to a joy rather than a must. Regardless of where the training takes me in the future, Frida has helped me reclaim my body, mentally as well as physically. 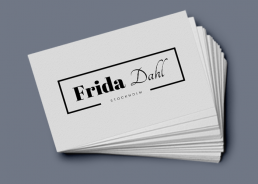 Frida gives and distributes her energy along with her knowledge. I highly recommend her.